"Please, you must save my master! It is your duty!" Volume 2 of Orphen sees us revisting Orphen, Cleao, and Majic on their journey to locate the demon, Bloody August. Whereas the first volume did a great deal to establish the setting and plot, this set begins to open up the story and is actually more entertaining overall. More humor is added, and the tone is more adventurous rather than strictly serious fantasy. This change in feel is very much welcome, and eases us into the series. Volume 2 begins with Orphen and his friends on the road. Depressed that the journey hasn't been very exciting, Cleao makes the suggestion that they alter their course and head for a local mountain range. Ancient myth has it that a mysterious monster lives somewhere in the mountains, and anyone defeating it will receive the "Golden Blessing," an enigmatic treasure. Orphen lets Cleao and Majic change paths, but he decides to pass on the opportunity. Unfortunately, Volcan and Dortin (the bumbling 'friends' of Orphen) are also after the treasure, and make Cleao's efforts much more difficult than they should be. Eventually, they all discover the mystery behind the legendary Golden Blessing, and it's not what you might think. After this, we're hurled into an exciting two-part story in which Majic stumbles upon a strange forest community that despises sorcerers, or all strangers for that matter. Majic is kidnapped by their leader, so Cleao and Orphen follow suit, trying to figure out a way to help him escape. Along the way they discover that the mysterious leader of the village may not be all he claims to be, and that the forest contains a Deep Dragon's Child (in this case, a giant wolf-god). Unfortunately, Cleao gets friendly with a wolf-god cub which complicates things even further. While I wasn't terribly impressed with the first volume of Orphen, this volume moves in a slightly different direction. It let's the characters be themselves a bit more, and loosens up on heavy story development. The central story, Orphen looking for the demon Azalie, is briefly abandoned in favor of some adventurous storytelling, and it works better. The first episode here, in particular, is a refreshing blend of fantasy and humor with a pleasant conclusion. If the rest of Orphen follows this trend of mixing the core story with more casual influences, it could certainly develop into an extremely fun and energetic series. It reminds me of older cartoons from the 1980s, actually, when marketing wasn't the central point of the show. Making things even stranger is the rather old-fashioned style of the artwork, which makes it seem much older than it is. While I previously mentioned that Orphen is probably being marketed towards people who liked the video game, it would appear that the simplicity of the game's story (I've read detailed impressions of the game, having not played it myself) has little to do with the anime. So, if you liked elements of the game's story, the series will probably feel more complete and substantive. Also, considering the rather low opinion of the game that the majority of Orphen fans seem to hold, it's probably best to just head for the show anyway. Image Transfer Review: While the animation itself is very traditional (hand drawn, cel, no digital touch-ups), the transfer itself has no problems. It's amazingly pristine and brings out all the detail of the artwork, for better or worse. At times, there's some slight print damage and the backgrounds seem a little rough (for lack of a better term), but none of it really makes any difference in the long run. Viewers should, however, not expect quite the same kind of quality as other, modern anime shows that use computers for most of the animating. Audio Transfer Review: The stereo soundtrack (present on both English and Japanese versions) is very nice and definitely functions well. Music and sound effects are well done, sounding powerful and loud. There is no surround activity, but the dialogue is rooted in the center channel very firmly. Everything comes across without any distortion or problems. No real complaints here. Allow me a brief rant here: It does bear saying that while the first volume of Orphen had a rather poor English dub the quality of the dub here is simply atrocious, and the writers should, quite frankly, be ashamed of themselves. In the first volume, the writing was drastically changed to alter plot points, but for the most part, the effect was minor. Here, the major changes in writing, plot, and overall tone are simply unforgivable. Secrets are revealed before they're supposed to be, names of certain things are changed, and most frustratingly, the voice acting just doesn't work at all. The characters are turned into teenagers with attitude, and don't fit the medieval/fantasy setting at all. Modern slang ("smackdown" for example) is introduced, and it sounds so silly it will probably make any anime fan ill. It's almost like the writers felt they HAD to change every line of dialogue, whether it be "Hello," or something far more complex. Any dignity Orphen hoped to retain is lost in this rewritten dub and I urge viewers to completely ignore its existence. I'll give an example (as I think this is an important issue): At the beginning of episode 4 Sleep In Our Flower Garden, Beast, Cleao complains about the journey so far. In the Japanese script, Orphen and Majic talk to her about her boredom. She claims she's bored with the route they're taking, so why not try the scenic mountains (which is where the Golden Blessing sub-plot comes in)? In the English dub, the scene is entirely re-written to where Cleao is complaining about wanting to go to the toilet and take a bath, so she suggests that they all go to a nearby spa in the mountains. At this point, in the English dub, Orphen gives away specific details about most of the last half of the episode, unlike the Japanese version. The whole point about Majic wanting to see the solar eclipse is pretty much abandoned. It's shocking and frustrating. Extras Review: Textless versions of the opening and closing credits are presented on the disc, along with a reel of conceptual art and production sketches. The artwork in this reel seems to be based on what is actually seen on this disc. Other than those elements, only trailers for other ADV releases are present. It's satisfying, but nothing special. 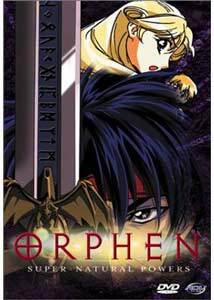 Orphen #2 improves my impressions of the show a bit and should go over well with medieval/fantasy fans. As usual, though, it'd be nice to see more than 3 episodes per volume.